I love making handmade holiday gifts. One of those gifts I make each year are holiday pajamas. Each year we set up the Christmas tree, hang the stockings over the fireplace and sing Christmas carols. Finally, the evening we decorate the Christmas tree each of our children open the first gift of Christmas that includes their new Christmas pajamas and a new ornament for the year. This year I put together this super simple and FREE raglan tee and pj pant pattern. But I wanted to add a little something so I designed these festive Christmas SVG files for Cricut. Today I wanted to show you how EASY it is to customize your Christmas pjs. To start you'll want to get your Cricut Maker ready. I've had my Cricut Maker for almost a year now. It is a great way to make DIY holiday gifts. You can learn more about the Cricut Maker here. The Cricut Maker can cut through SO many different materials. 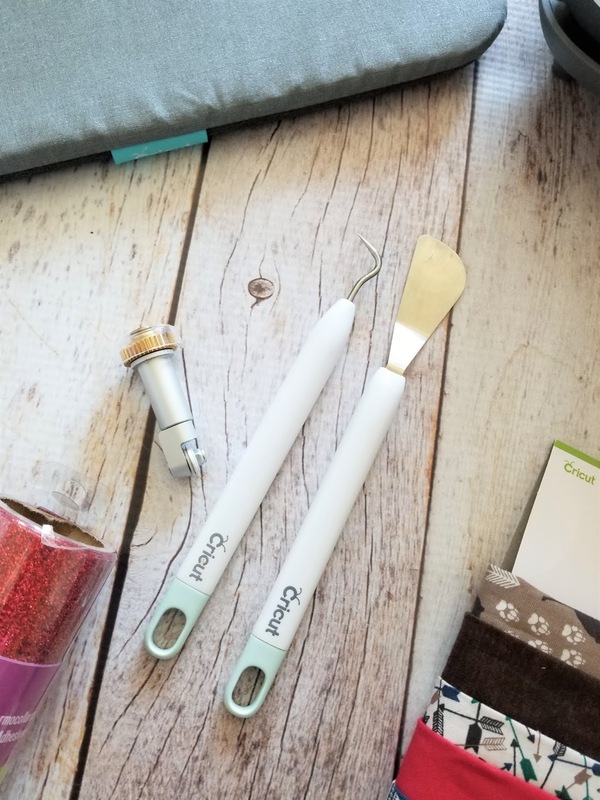 It's perfect for crafting projects, sewing projects and making quick t-shirts. Or you could pull out all your paper crafting supplies and make some DIY holiday cards. However, for this project I cut out both Iron-on Vinyl and fabrics. To cut out vinyl, you need the Premium Fine Point Blade. To cut fabric, the best choices is to use the Rotary Blade and Housing. The rotary blade is one of my favorite features about the Cricut Maker. If you want to see it in action, just check out the video later down in the post. But this is what the blade looks like (pictured below). It is so cool to watch this blade work and cut through fabrics. It works just like a hand held rotary blade. For this project, I started by designing these Christmas SVG files in Cricut Designs Space. I knew that I wanted to use both Iron-on Vinyl and Fusible Fabric. This would give the shirts just a bit more texture and a fun element that you might not normally see on a pajama top. I used black iron-on vinyl for the words and for the large red images I cut them out in fusible fabric. You can grab all these designs in Cricut Community. I've linked them all below so you can grab them for yourself. These would also be fun DIY holiday decorations. You could use them to make a simple reverse canvas project. Now let me walk you through the quick steps on how to cut out and apply your cut files in both vinyl and fusible fabrics. Start by loading the cut designs into Design Space. Send them to be cut. Make sure any images you cut with Iron-on vinyl are set as "mirrored". Also, make sure to change your material to fusible fabric for when you cut out your larger fabric pieces. Weed you designs. This is probably the most time consuming part of these Christmas SVG files for Cricut. You have to take time to weed them. For weeding your fusible fabric, you may want to grab a small pair of scissors. Sometimes there are a couple of spots that need trimmed to remove them from the cut design. If you've never used fusible fabric, one side has a smooth texture. This is the fusible side. You can simple press the design to your fabric and it will stay in place. I've used fusible fabrics a ton like with my Fall Pillow covers. It's easy and gives your projects such a fun look. Grab your t-shirt and press it for about 5-10 seconds with the EasyPress 2. This removes any moisture and gets the surface nice and flat for your Iron-on and Fusible fabrics. Next, place your weeded design onto your t-shirt. You'll also place your fusible fabric cut out. Follow the Cricut temperature chart to know what heat you need to use for each design. Start with the highest heat and move to the lowest heat. You'll fuse both your iron-on and fabric to your t-shirt. Finally, place your design on your sewing machine. Stitch around your fusible fabric design. I typically use a small zig-zag stitch and sew around the entire design. This will keep it in place so during washing and wear the design won't fall off. And there you have it!! A fun and festive holiday pajama top that adds just a bit more to those fun pajamas. 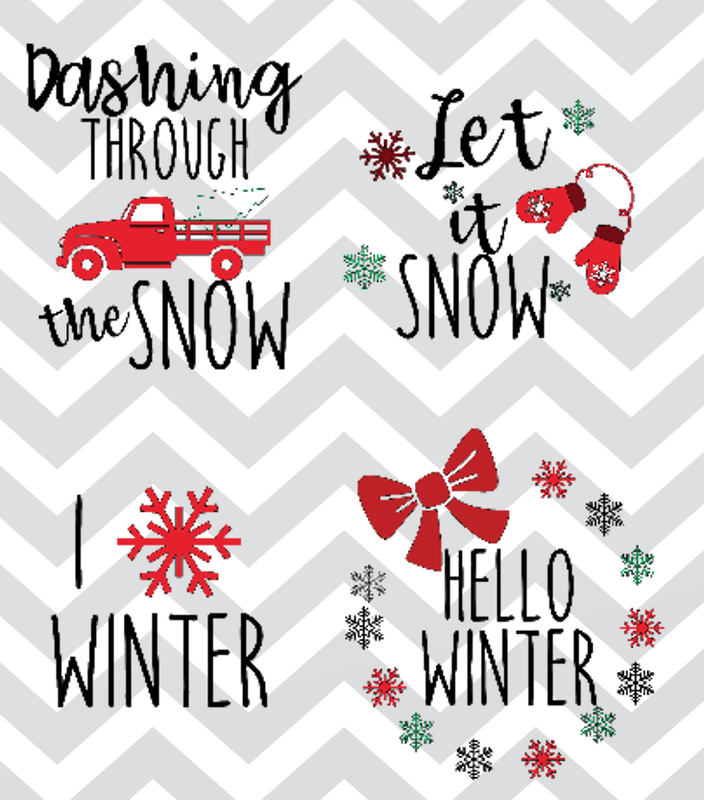 I hope you'll enjoy these festive Christmas SVG files for Cricut. 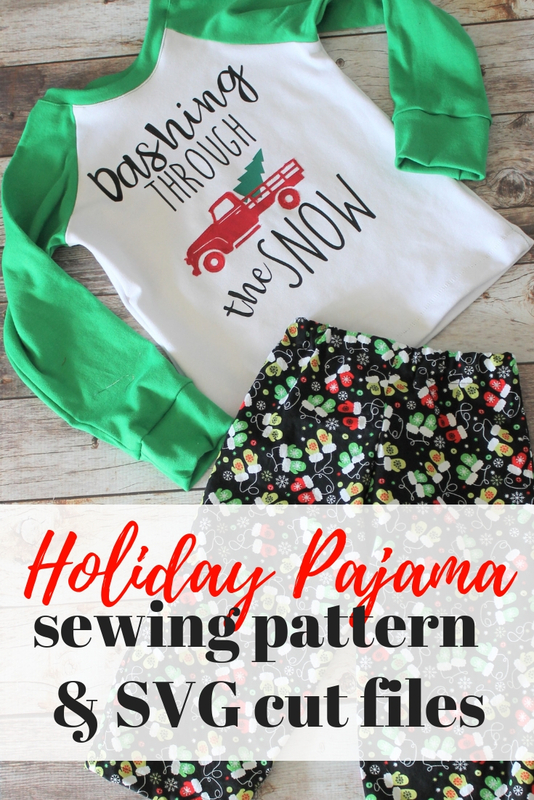 Don't forget, if you are in need of an easy pajama pattern, go check out our FREE Happy Holiday Pajama Pattern. Just for our GYCT Community readers!